All weekend we discussed Hrant Dink’s murder with both Turks and ex-pats, and it’s clear that everyone is concerned. At a time when Turkey is clearly the most open and democratic country of the Muslim world, this casts a dark shadow over the country that Dink was attempting to unite. Turkey’s constitution has a clause against “insulting Turkishness” which has brought many outspoken writers to the court system, including Hrant Dink and Orhan Pamuk, although recent court decisions have relaxed this rule in favor of freedom of speech. Now a rabid young nationalist has taken the law into his own hands to quiet Dink’s comments with bullets. This is unconscionable. In a world where most people want peace, what is happening? Where has tolerance gone? Enough of that. On to the brighter side of our weekend. After a sunny Turkish breakfast in our hotel’s terrace restaurant on Saturday, Jamilah and I headed off to meet Tania Chandler. 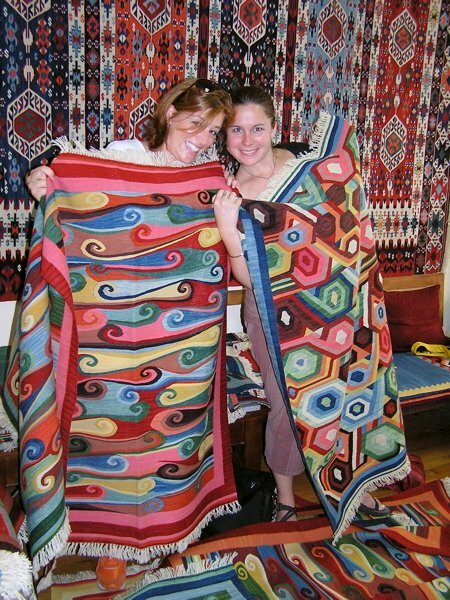 She had promised us a visit to her artist/weaver friend, Musa Başaran. 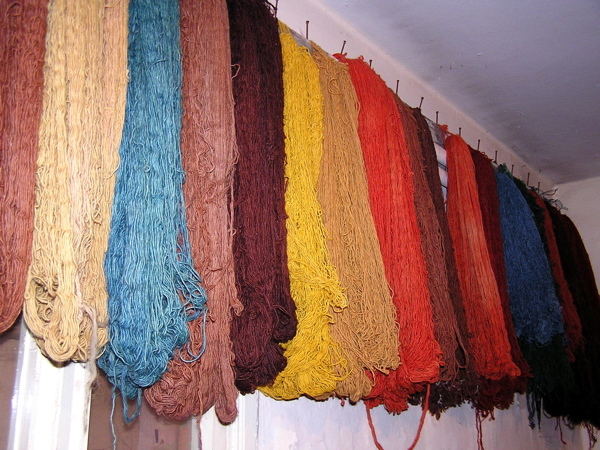 Tania goes to weave a few times a week in his studio, a building overlooking the Marmara just blocks from the Blue Mosque. Tania rang the buzzer and pushed open the heavy cast-iron door into a weaving wonderland. Musa greeted us warmly with, “Come in and take off your clothes.” Our astonished laughter revealed his mistake. Blushing and laughing along with us, he proffered the usual cup of tea. I was entranced with the kilims hanging in his studio. His designs are both traditional and modern, but I was particularly taken with Ottoman Tulips embroidered in silk on textured wool backgrounds. Musa’s colors are vibrant, and his designs captivating. I’d landed in kilim heaven. 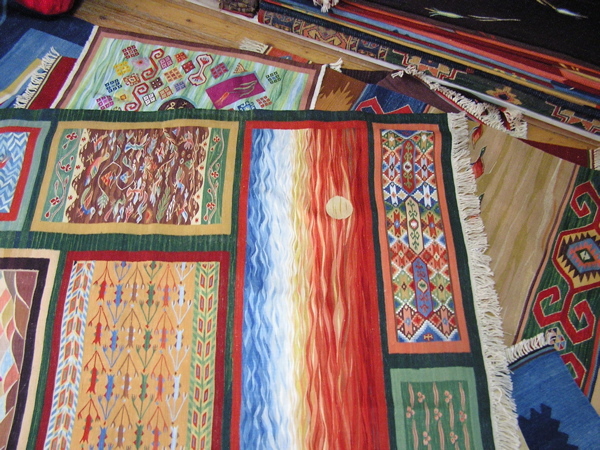 He spent an hour sharing the vast array of kilims in his present stock, finishing, of course, with the silks. Silk is the ultimate in carpeting. 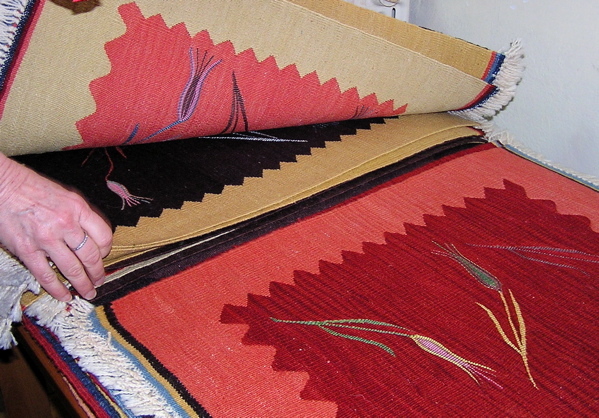 One feature of his weaving that fascinated me was a wavy techique that adds depth and texture to a weaving. Different shades of the same hue are woven irregularly through the weft, creating a stunning wave-like effect. It can be done subtly with very close shades, or in contrasting colors and shades for more drama. In any case, it’s lovely. Musa shares his designs with rural village women, who weave copies of the patterns, some with slight variations. 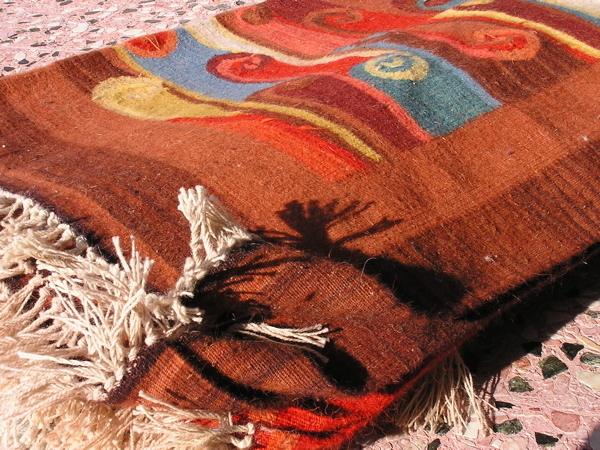 It takes from a few weeks to six months for a woman to weave a kilim (depending on the size and pattern), then Musa pays for and transports them back to his workshop. The next steps are to burn them (yes, burn), clean them, and press them. Musa and his brother Haydar comb out the fringe, then carry the heavy kilims up to the fifth floor terrace, where they use a blow torch to burn loose fibers and straw from the surface of the kilims. I must say, I was taken with the terrace’s commanding view of the Marmara, a perk for hauling those kilims up that long spiral staircase. We could see all the way across to Yalova under the brilliant azure sky. My goodness, this winter has been like spring. Last year at this time we were buried in a blizzard. After burning, Musa’s kilims are hauled back down the winding marble staircase and sent out to be cleaned and pressed before they’re ready for sale. 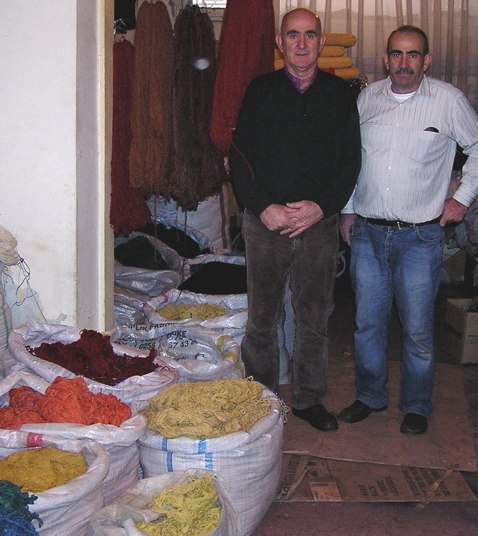 Musa sells at wholesale prices from his studio and does occasional rug shows; his clients come to him by word of mouth. “I don’t sell to carpet shops,” he says. He doesn’t need to. Musa’s doing just fine. I was surprised to learn that he started his career as a corporate economist, but he prefers this creative life, which gives him precious time with his family. Here I sit, on my comfortable couch, slightly full after wine and pistachios with Marnie and her daughter Jen, then a few pieces of leftover pizza and a dish of sutlac pudding at home. My lojman is toasty warm, my exams are all corrected, my paycheck has been deposited, and life is good. In the minute it took me to write that, 21 children died of hunger, most of them in Africa, not far from my warm, cozy Istanbul home. A third of the exams I read were essays by my seniors, who just completed a global issues unit with a focus on poverty. I told them when we began the unit that they would become experts on world poverty, and they have. After reading their exams, I can think of little else. Most of us know that there are 6.5 million people in the world, but did you realize that one-fifth of them (over a billion) live on less than a dollar a day? Or that half of them live on less than $2 a day.? That’s scary. According to UNICEF, nearly 11 million children die each year as a result of hunger. That’s 900,000 a month, 225,000 a week, 30,000 a day, 1250 an hour, and 21 a minute—one every three seconds. That’s scary. One in five children in the U.S. lives in poverty, and one of every two children in the world lives in poverty. That’s scary, too. Which will destroy us first, global warming or the inequities in our world? Think about why 9/11 happened—really. The gap between the haves and the have-nots grows wider every year. I took a quick survey on the Earth Day web site (www.earthday.net/footprint), and I realized how much more of our world’s resources I use than my share. It would take 3.3 planets to support everyone in the world at my Istanbul lifestyle (no car, small home), and 9.1 planets to support them at my U.S. lifestyle (a bigger home and a car). That’s also scary. Do you know about the United Nations’ Millennium Goals? The richest countries in the world pledged in 2000 to donate .7% of their annual budgets (yes, less than one percent) to aid developing countries. Of the 22 wealthiest countries, only five have met that goal: Norway (.9%), Denmark (.87%), Luxembourg (.82%), the Netherlands (.8%), and Sweden (.79%). The U. S. came out at the bottom (.16%), which is pretty embarrassing. It helps to know that we are so rich that even .16% of our GNP puts us at the top in the amount we donated. To put the inequality of our world into perspective, imagine yourself in a room of 100 people. Now distribute 100 pounds of potatoes. Give 25 pounds of potatoes to each of two “privileged” people, then give 1/2 pound (two small potatoes) each to 18 more people. Now distribute the other 14 pounds of potatoes (about 28 small potatoes) unequally among the remaining 80, making sure that the last 20 share one potato among them. How would you feel if you were the “lucky one”? How would you feel if you were one of the 20 who received only a taste? We haven’t even looked at things like water, shelter, and medical care, but they all follow the same pattern. The reality is that the richest two percent of the world’s population hold over half of the world’s wealth. The richest 20 percent (that would be us) consume 86 percent of the world’s goods. What’s wrong with this picture? For some reason I thought the war on poverty was being won, but I was wrong. So why is poverty getting worse rather than better? One of the culprits is globalization. Multinational firms have found cheap labor markets overseas, where they don’t have the expense of benefit packages. One example is Nike, which pays Indonesian workers about $2 a day to produce sporting equipment and shoes. Most of those workers are women and children who work long hours under unsafe conditions. If they complain, there are others who would happily take their places. Because of the low wages, parents don’t earn enough to feed their families, so their children work as well. The children can’t attend school because they work, so they’re not getting the education they need to break this cycle of poverty. If these firms would pay a decent wage, more adults could work, their children could attend school, and their incomes would help to support their communities. Of course, Nike doesn’t want to eat into their profit margin, so it “ain’t gonna happen.” These people were better off before the factory moved in. Of course, Nike isn’t the only culprit, and there are many other factors involved in this cycle of poverty. Developing countries are often the victims of corrupt governments that misuse aid, leaving the people no better off but deeper in debt. Trade tariffs favor some countries over others, and less developed countries are unable to compete on the global market. Wealthy countries buy up huge amounts of produce from poorer countries, leaving little to feed their residents. Undeveloped countries are drowning in loan payments when they need to put all their resources into their own infrastructures. A lack of education and medical care contribute to unconscionable loss of life to illnesses that could be prevented (like AIDS). There are many reasons for world poverty, but we need to look to its cure. I remember as a child saying, “Well, you can send my lima beans to those starving children in China. I don’t want them.” I feel differently now. I need to find ways to get lima beans to those starving children. My seniors, through their research, presentations, writing, and exams, have opened my eyes. After break we’ve scheduled a planning session to take collective action. Coming to Istanbul has opened my eyes to a lot of things. I see how fortunate I am, yet I also see the desperate need most of the world lives in. I have a totally different view of myself, my country, and our role in the world. It’s not a pretty picture, but I have hope. One must have hope. Exams start tomorrow. The kids are hyped—as in nervous, anxious, and overwrought. Unfortunately, that translates into explosive behavior, especially for Turkish kids, who lean a bit toward the exuberant end of the behavior continuum. Today was wild. Testing in this country is a whole different game than in the U.S. It’s everything. Kids are tested to get into school, to step up to better schools, and to go to university. Because the system is short on educational opportunities, exams have inflated importance here. In the U.S., many students study for tests, while here it’s the rare student who doesn’t. At least a third of my 62 students (bright kids to start with) have private tutors. In the U.S. I might have had one or two (out of 130) with tutors. Tomorrow is the first of five days of semester finals. Each exam is 8o minutes long, and the students sit two exams per day, for a total of 10 exams. Teachers proctor an exam each day as well as a 40-minute study hall every other day. We spend the rest of our time correcting. Oh, yes—there’s another difference. Grading exams in Turkey is tantamount to hell. I only have 62 students, but I spend an average of a half hour on each exam. That’s a LOT of time! Welcome to our lockstep world. It’s all about moderation. Here’s how it works. We have a team of six ninth grade teachers teaching nine sections. All the students take their exams at the same time in nine different rooms. Once they’ve finished, three or four exams are xeroxed, and every member of the team grades them separately. Next we meet to compare our grades, standards and expectations. (Lawsuits are common over perceived grading inequities.) OK, then we hibernate to grade our own exams. Our focus is language as much as content, since Koc strives to be a bilingual school. Depending on the grade level, 30 to 40 percent of the grade is based solely on language. That means meticulous marking. Once we finish grading all our exams, we take the next step in moderation. We exchange a number of exams with other teachers who grade them a second time to ensure consistency within the grade level. If there are inequities, grades are adjusted to meet the standard. Whew! It’s a lot of work—difficult work! As a teacher who comes from a performance-based assessment background, the focus on testing is painful. For the students, it’s even worse. With testing comes pressure, which these kids feel intensely. My IB seniors get a little frantic before exams, fearful that our class has dealt with the subject matter differently than what they’ve heard from other classes. The differences between teachers and their teaching styles isn’t valued as much here as it is in the States, and I understand why. It’s all about exam grades rather than actual learning. Do I sound biased? I am. There was an article in the newspaper this week about some private schools in Istanbul that teach to the tests. Rather than following the prescribed curriculum, they spend class time on practice tests to prepare for the 8th grade exam. That’s a no-no, but I have to admit, I wonder why. If the system is test-driven, why not teach to the test? There was another newspaper article mentioned by one of my Turkish peers about abolishing oral grades completely. (Oral grades are the in-class work and homework averages.) Why have teachers? All we’d need is exam proctors. What is this world coming to? It’s exam week, and I had a bad day. My goodness, we had a good time! Never mind that we had to leave campus at 3:00 AM. Never mind that it was drizzling when we landed. Never mind that I didn’t get quite enough sleep. I had a WONDERFUL holiday in Prague. We ten started our 5-day sojourn in Prague with a bus-tour-on-foot. That was a bit of a shock, as a few of our group had their warm clothes tucked away in suitcases. Inaccessible suitcases, as we wouldn’t be able to check in until afternoon. Luckily, the drizzle had subsided, and our Turkish-speaking tour guide (yes, another problem) did his best to communicate with us in English. Hmmm… So much for booking through a Turkish travel agent! Anyway, we navigated our way through the Prague Castle and St. Vitus’ Cathedral (OH, my goodness, it was splendid! ), then on down through narrow cobbled streets to the famous Charles Bridge that crosses the Vlatava River. We gaped, gasped, and shivered our way across the bridge with throngs of other tourists, all enjoying the many statues, musicians, and artists along the way. I guess that’s why it’s such a hit; there’s plenty to see along the Charles Bridge. Our favorite was the statue to Prague’s Saint John of Nepomuk, who we had also seen in St. Vitus’ Cathedral. Friar Nepomuk had been a confessor to Queen Sophie and refused to reveal her secret lover to “Good?” King Wenceslas IV. After being tortured to death, his body was thrown from the Charles Bridge, and legend has it that bright light and five stars appeared from the water below the bridge. He was canonized in 1729, over 300 years after his death. His statue is a favorite on the bridge, and people wait in long lines to touch two brass reliefs at the foot of the statue for good luck. We were told later that touching the dog picture brings bad luck. Go figure! Speaking of dogs, they are on leashes everywhere in Prague. How different from Istanbul, where a leashed dog is a rarity. Libby would have been in heaven! We were chilled to the bone by the time we reached the Old Town Square and the Astronomical Clock. Some settled into a warm restaurant for coffee, while others of us hit the Christmas market for mulled wine and pork sausage. HEAVEN! You have NO idea how delicious a fat, juicy pork sausage tastes if you’ve been deprived of it for months. Hog heaven! We finally found our way to our hotel, which was lovely. The restaurant was cozy and had a delicious and reasonably-priced menu, and the newly-renovated rooms were tastefully decorated and spotless. Laura and I scored a spacious corner attic room, which she dubbed “the nicest hotel room I’ve ever stayed in!” Remember, though, that Laura has been living in hostels for the past month. Laura and I had a bowl of soup, dropped our clothes, and headed back into the city. Our hotel was near a tramline, and we found our way around the city easily using trams and metros. There was a noticeable absence of traffic, too, probably due to Prague’s convenient and inexpensive public transportation system. We wandered through the Christmas market again and across the Charles Bridge, then rested our weary feet in a little pub that served us “Christmas crepes”, which were over-priced Christmas cookies from a tin—the kind that all taste the same. The mulled wine and hot chocolate were good, though. After an hour in a used bookstore (a veritable treasure trove) we took in a music concert at the Lichtenstein Palace (they let Laura in free because she was Laura–my inimitable, charming niece), then stopped afterwards for hot ham sandwiches before heading back to the hotel. Sunday dawned clear, and four of us (Dee, Terri, Laura, and I) headed off for Kutna Hora, a town famous for a number of churches, including a Bone Church. Hmmm… It was fascinating–though a bit macabre. Most everything was closed, so we had a hard time finding our way to the Cathedral of St. Barbara. Our reward was an evening mass, complete with organ music and a children’s choir. It was spectacular to experience that 14th century splendor in the glory of worship. We felt a little like interlopers, but we kept our hands folded as we gawked at the workmanship of 500 years of effort. We got back to Prague just in time to be overwhelmed by the New Year’s Eve festivities on Wenceslaus Square. A brilliantly lit stage throbbed with music just below the National Museum, also lit and decorated for the event. Even at 7:00 crowds milled as the evening’s celebrations began. We wandered through the area and then on to the Old Town Square, which had its own celebration well in hand. We indulged in another meal of pork sausage and mulled wine–why not? We gathered at the hotel to ring in the New Year with our friends, amazed at the MASS of fireworks going off in the street as well as overhead, especially at 12:00. Young men sang in bass voices from across the street, and one climbed out on the roof just after 12:00. Maybe not such a good idea for someone who’d been drinking! A few of us finished off the night with a trek to the local pub, where we were warmly welcomed by an artist, his wife, and their grown daughter. That evening rubbing elbows with the locals was a real highlight for us. Another highlight of our trip was a tour of the Jewish Ghetto. We hired a private guide (for a whopping six dollars), and this elderly woman fascinated us for two hours with information about the history and lives of the Jews in Prague, trekking through the synagogues, through the streets, and around the Jewish Cemetery. It wasn’t until she finished her tour that we asked where she had been during the war. She’d been in hiding with her father until near the end of the war, when they were sent to Terazin Concentration Camp. The rest of her family had been deported sooner, and none of them survived. Hitler’s troops anihilated all but 15 percent of Prague’s Jews. The rest of the week was replete with shopping, eating, a boat tour, museums, a jazz club, and a pub crawl. We stayed busy every minute, yet somehow found time to sleep. I’m not just sure how. Our last stop in Prague was the grocery store. We came back with pounds of ham, bacon, sausage, and cheese. Of course, Prague has MUCH more exciting things to offer. It’s just that we live in Istanbul.